Police say they’ve tracked down the Honda sports car believed to have struck and killed a cyclist, but the person behind the wheel remains at large. San Jose police say they’ve found the red sports car believed to have struck and killed a bicyclist, but the person behind the wheel is still at large. Witnesses told police they saw the driver of a red Honda Del Sol crash into a man on a bicycle on South Winchester Boulevard between Loma Verde Drive and Payne Avenue just after midnight Friday. Police say the driver continued driving northbound. "It appeared that the bicyclist was struck by the vehicle and that the vehicle fled the scene northbound on Winchester Boulevard," San Jose police spokesman Albert Morales said. Police found the car with front-end damage consistent with this type of crash. The car was also found behind Victor's Taqueria shop. The shop owner did not know about the fatal hit-and-run, but knew the smashed-up vehicle had been involved in something. "When I saw the car it looked like a tree fell on top of it, you know?" shop owner Victor Bailon said. "It looks real bad. My reaction was that it was suspicious and to call police." San Jose police say they found the red sports car believed to have struck and killed a bicyclist, Friday, Feb. 12, 2016. The victim is a man whose identity has not been released. 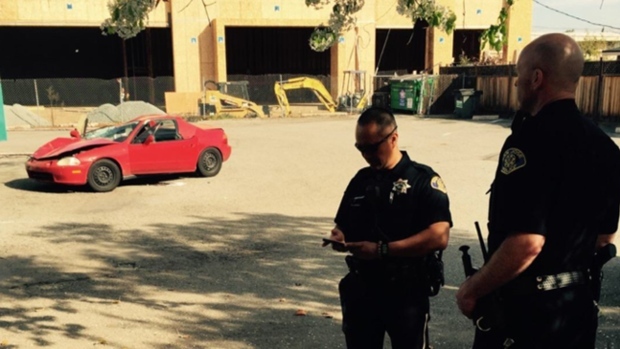 He is the sixth person to die in a traffic fatality in San Jose this year. Miguel Gonzalez, who owns a business near where the car was found, said he could not believe someone would leave an injured person behind. "The police said there was a bottle in the back of the car, so maybe there was something involved with drinking," Gonzalez said. Police are examining the car for clues and continue to search for the driver. Investigators still do not know why the driver ran and all they seem to know from witness accounts is the driver knew what happened. Investigators late Friday said there have been no reports of the vehicle being stolen and police are trying to track down the registered owner. The coroner is working on making a positive identification and the victim's name will not be released until the family has been notified. Anyone who can provide any information on the car or the driver is asked to contact the San Jose Police Department. Friday's fatal crash follows after a 60-year-old man on his bicycle died Jan. 15 in another hit-and-run accident, after police say the driver struck him twice on Delmas Avenue at West Santa Clara Street, reversing over him in order to get away.